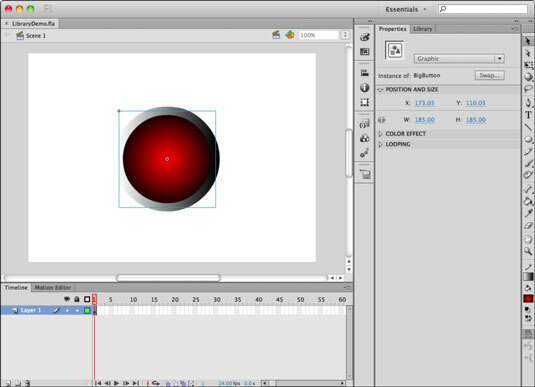 Most common animation sequences in Adobe Flash CS6 require the use of symbols, so you should become familiar with the most basic symbol type: graphics. You can convert any object on the stage into a graphic symbol, which allows you to take advantage of additional features that are unique to symbols. You can also create empty graphic symbols from the Library panel or by choosing Insert→New Symbol and adding content to them afterward. Choose Insert→New Symbol or choose New Symbol from the Panel menu in the upper-right corner of the Library panel. The Create New Symbol dialog box appears. Assign a name to the symbol, select Graphic from the Type drop-down list, and click OK.
You see a blank slate on the stage, where you can add to your symbol. Within the new symbol, use your drawing or type tools to create some interesting artwork. Choose Scene 1 from the navigation bar above the stage to exit the symbol and return to the main Timeline. You see your new symbol listed in the Library panel. Note: The symbol won’t appear on the stage until you place it from the Library. Create some interesting artwork by using the drawing tools. Using the Selection tool, select the new artwork on the stage. Enter a name for the symbol, choose Graphic from the Type drop-down list, and click OK. Your new symbol is now listed in the Library panel. Whenever you convert existing graphics to a symbol, the graphics remain on the stage, enclosed inside a blue bounding box. The Property inspector confirms that the selection is now a graphic symbol (indicated by the icon), and this is your first instance of that symbol ready for use. Don’t confuse symbols with drawing objects: Both display artwork inside a bounding box, but drawing objects don’t have the same abilities as symbols, nor are they stored automatically in your library. Use the Property inspector to determine whether an object is a symbol or a drawing object if you’re unsure — a distinctive icon and description appear for each one at the top of the Property inspector.